Did you know: The caracals name is believed to come from the Turkish word Karakulak, which means black ears. The caracal is a striking medium-sized, robustly built cat with long powerful legs, large paws, a short tail and ear tips with long hair tufts. In South Africa, the caracal is also known as a ‘rooikat’ or ‘lynx.’ And although many know them as ‘lynx,’ they are actually only distantly related to other “true” lynxes such as the Eurasian lynx, the Canadian lynx, the Iberian lynx, and the bobcat in the United States. The most distinguishing feature of caracals are their very sharply pointed, lavishly tufted ears. They have short, dense coats and range in color (depending on geographic locality) from light sandy through reddish-fawn or light cinnamon to deep brownish-red, reddish-grey or rich brick-red. Although they appear to be mostly uniformly colored, upon closer inspection, subtle black and white markings are present on their face, and they have white “bellies” with dramatic red spots. Caracals are extremely widespread; they are found throughout Africa, the Middle East and southwestern Asia. Within southern Africa, they are particularly widespread, and are so numerous within areas such as the Western Cape of South Africa that they are considered ‘pests’ because some individuals will prey on livestock in farming areas. Their reported highest population density in the mountainous terrain of the Eastern Cape Province of South Africa. Though essentially an animal of dry regions, the caracal has a wide habitat tolerance: woodlands, savannas and acacia scrub throughout Africa; jungle scrub and desert in India; arid, sandy regions and steppes in Asia. Like most wild cats, caracals are primarily solitary and territorial animals. However, they may form pairs for the duration of mating or small mother-offspring groups during rearing of young. Adult males hold territories which they patrol widely, mark with urine and scats, and defend against other adult males. Male ranges are up to 3 times larger than female ranges and may overlap the ranges of several females. Typical cat vocalizations of growls, spits, hisses and miaows, but also a distinctive loud coughing call, similar to a leopard’s, during mating; purrs like a domestic cat when content. Few studies have examined caracal reproduction in the wild. However, females average 1 litter per year and the gestation period is between 62 to 81 days. Caracal litters range in size from 1 to 4 with an average of 2 kittens. Kittens are thought to start eating meat at 4 weeks, and are weaned at 4 to 6 months. The young will mature quickly and may be fully independent at 10 to 12 months. Males can reproduce at 12-15 months of age, while females can reproduce at 14-16 months of age. The caracal life span may be up to 12 years in the wild, though the survival rates to adulthood, and average age at death in populations will vary according to region and be influenced by human disturbance. One caracal has lived to 19 years in captivity. The caracal diet depends on the geographic region caracals are found, but they are known to be generalists and strictly carnivorous. The majority of their diet comprises prey species, but they aren’t “picky” about what those prey species are! They are opportunistic predators – across their geographic range, they are known to commonly prey on rodents, hares, hyraxes (dassies), small monkeys, and small antelope. They may prey on birds ranging from doves and game birds, like guinea fowl and francolin, up to kori bustards and eagles. They are also known to prey on other small carnivores. Occasionally they eat reptiles, including lizards and poisonous snakes, and invertebrates such as insects and scorpions. Caracals don’t usually scavenge. Caracals, like many wild cats, are ambush predators. They quietly stalk their prey as closely as possible and then rely on a direct pounce, leap, or short run to catch it. Caracals are known for their acrobatics. They use their agile leaping and climbing ability to catch hyraxes in rocks and birds from the air. With smaller prey, the caracal’s long canines can easily penetrate to the prey’s spine but with larger prey, like antelope or sheep, due to the thickness of skin and muscle, it is more effective for the caracal attack the throat. For larger kills, such as an antelope or sheep, the caracal may drag the kill into dense cover where it can be eaten without disturbance. The physical morphology of the caracal suggests that over evolutionary time, this species has evolved numerous very specialized adaptations. Their strongly patterned face is thought to enhance visual communication between caracals. Their ears ears are controlled by 20 different muscles, and their long tufts are thought to enhance their hearing by directing sound waves into ears. Their powerful hindquarters can launch caracals 3 meters (10 feet) into the air from a sitting position. Like most cats, their sight and hearing are very good while their sense of scent is moderate. In southern Africa, especially South Africa and Namibia, the caracal is seen as a ‘problem animal’ or a livestock killer and they are heavily persecuted in farming communities in particular. Caracals are also threatened by severe habitat loss as people move further into their territory and their prey species are driven out. Hunting for skins and ‘luxury’ bush meat is a threat in Central and West Africa. The African caracal population is not protected over most of their range while the Asian population is protected over half their range. The Asian population listed as endangered by some agencies; the Indian subspecies is highly endangered. IUCN Red List: Least Concern; rare in Turkmenistan (last assessed in 2002). Due to similar distinctive ear tufts and short tail, the caracal is often called a ‘desert lynx’ though it is not closely related to the lynxes of the northern hemisphere. 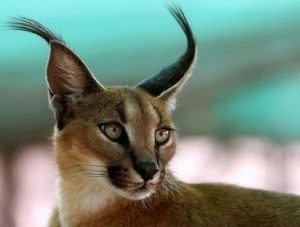 Caracal comes from the Turkish name ‘Karakulak’, meaning ‘black ear’. Egyptians portrayed caracals in wall paintings and in bronze as elegant hieratic figures sitting upright or as guardians of tombs; they also embalmed their bodies and placed them in tombs. In Persia and India, the caracal was trained to hunt birds as well as hares, foxes and small antelope.